Jobbatical recently carried out a survey to support the creation of a digital nomad visa for Estonia and the Schengen area. Preparations are in full swing for the visa, which would let digital nomads live and work in Estonia for up to 12 months. So now’s a good time to take a step back and look at some of the insights we gained from the survey. Immigration laws aren’t keeping up with the realities of the workforce. Our survey found that across the board, visa issues are the biggest obstacle to pursuing the digital nomad lifestyle. 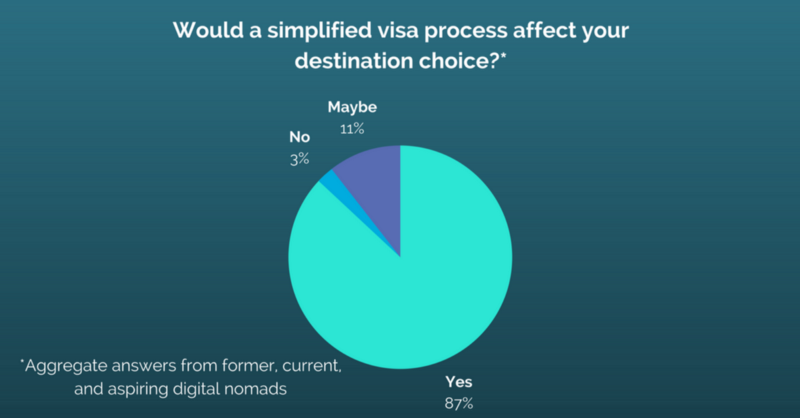 A majority of current and aspiring digital nomads would let simpler visa processes affect their choice of destination, presenting an unprecedented opportunity for countries to attract skilled professionals with spending power to their borders. Nomads’ unpredictable revenue streams must be factored into the visa process. Following the rules as they currently stand can indeed be tricky for nomads. Visa applicants might be asked to prove they have €3000 for each month they plan to spend in the EU before applying for a long-term Schengen visa. With their actual incomes often fluctuating significantly from month to month, digital nomads are feeling the need for updated financial requirements to travel and work freely: two-thirds of location-independent workers report they would not be able to prove an income of 3,000€ a month. This doesn’t mean they don’t earn enough to live comfortably—it simply signifies the system is outdated. “It should be based on average per month income based on annual income generated,” one respondent commented on the requirements. 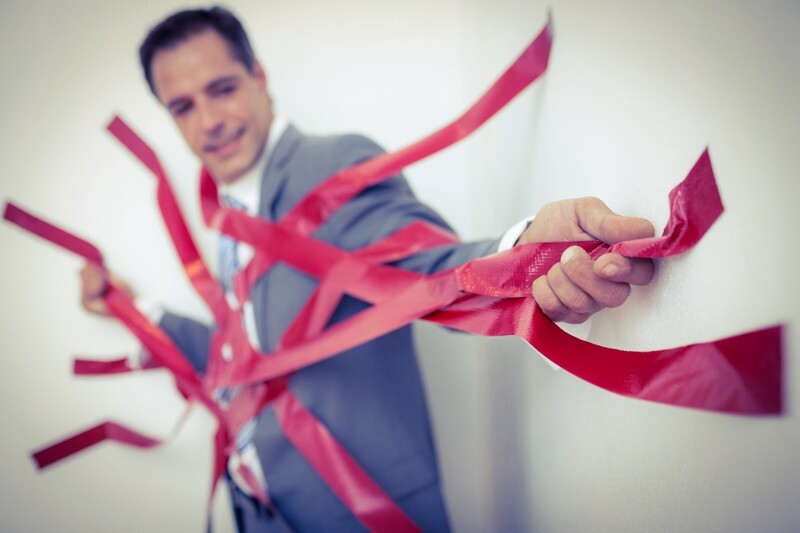 The modern location-independent workforce is fed up with the red tape. It’s up to governments to change the game. 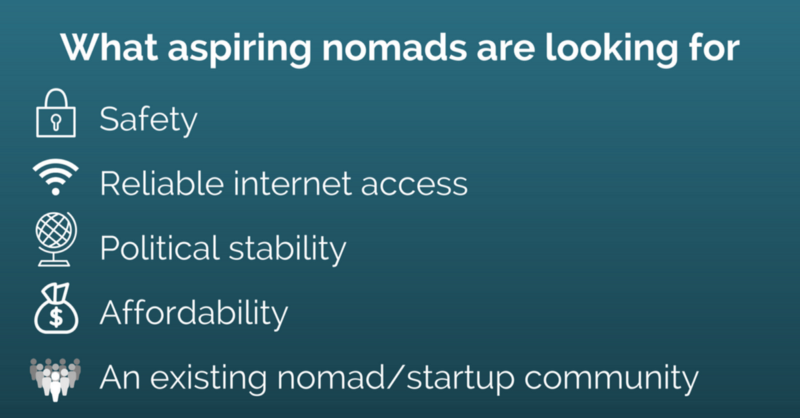 Visa issues aside, what do digital nomads look for in their destinations? Climate is certainly still a factor for nomads, and tropical locations like Chiang Mai, Bali, and Bangkok (all among top 7 places mentioned in the survey, with Chiang Mai taking the lead among current nomads) remain popular. This gives an edge to European cities like Tallinn, Lisbon, Barcelona, andBerlin, all of which also fit into the top 7. These and other emerging European cities get all the attention from the location-independent cohort when it comes to innovation, advanced digital societies, and infrastructure.